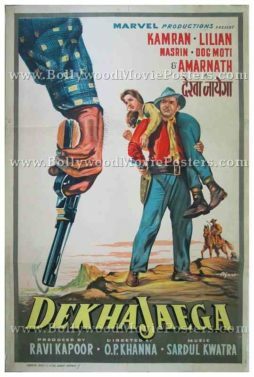 Old Bollywood movie poster of the Hindi film, Dekha Jayega (1960) for sale. 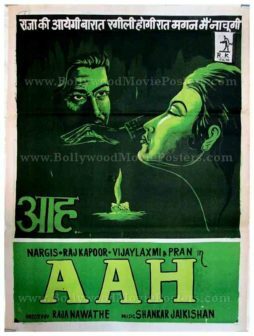 This is an actual surviving original vintage Bollywood movie poster of the 1960 Hindi film produced by Marvel Productions. 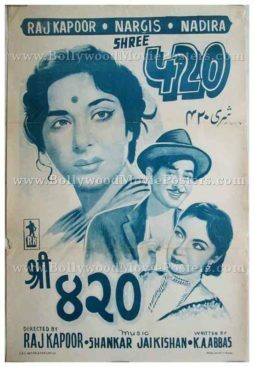 This vintage Bollywood movie poster features stunning hand painted artwork. Originally hand painted on canvas by a leading Bollywood poster art studio in Bombay called Ajanta Art, this vintage poster has a true classic Western feel to it. 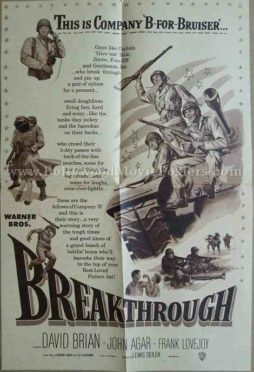 A hand is seen prominently on the left holding a smoking gun. 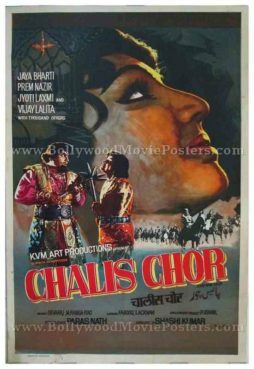 The scene appears to be a showdown duel with the villain who has held the heroine hostage. 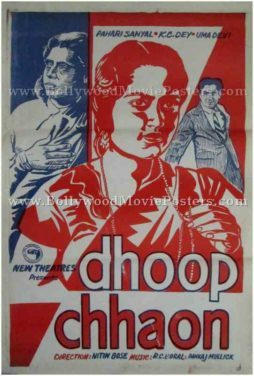 This hand painted Bollywood poster also credits “Dog Moti” in the credits as seen on the top right hand corner. 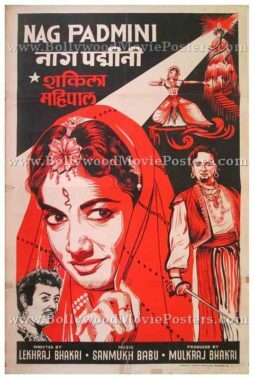 Old Bollywood movie poster of the mythological Hindi film, Naag Padmini (1957) for sale. 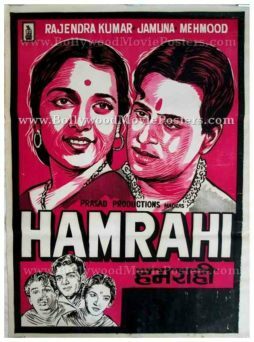 This is an actual surviving original vintage Bollywood movie poster of the 1957 Hindi film which featured Mahipal and Shakila in lead roles. 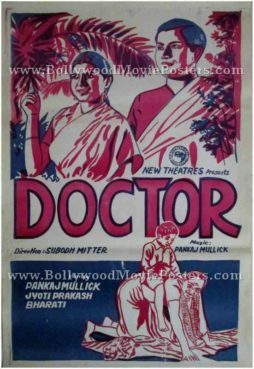 Printed and circulated during the first release run of the film (mid 1950s), this old hand painted Bollywood movie poster was originally designed for publicity of the film but never ended up being used. 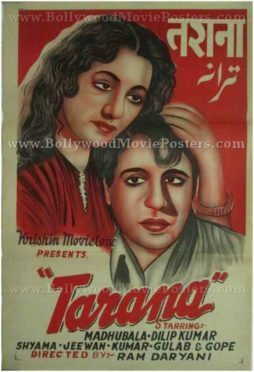 This vintage Bollywood movie poster features stunning hand painted artwork. 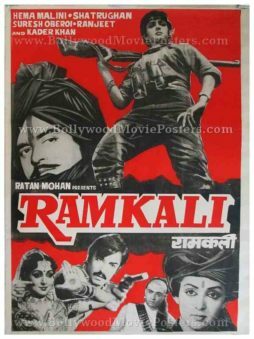 True to the serpent theme of this mythological, a snake is seen painted on the top right hand corner of the poster. 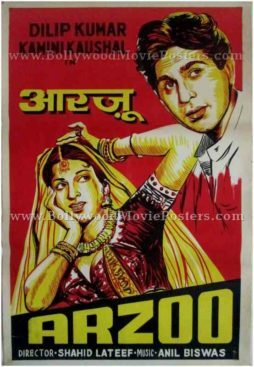 A combination of different shades of red gives this old Bollywood poster a very catchy appearance. 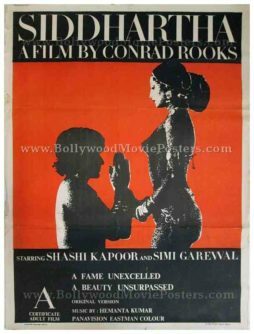 This old Bollywood poster was originally designed in hand painted oil on canvas format. 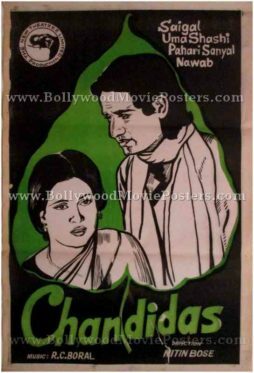 Extremely rare, hand drawn classic Bollywood movie poster of the hit Hindi film Kabhi Haan Kabhi Naa (1993) for sale. 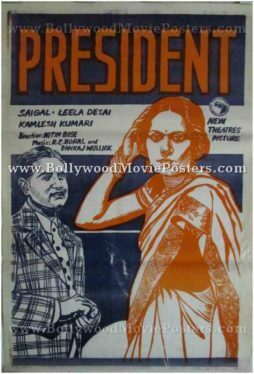 Featured here for sale is an actual surviving publicity poster of the hit 1993 romantic comedy, Kabhi Haan Kabhi Naa, which starred the reigning superstar of Bollywood, Shahrukh Khan (SRK) in the lead role. 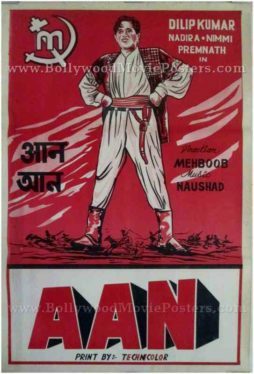 Kabhi Haan Kabhi Naa was released at a time when movie poster design techniques in India had completely shifted from handmade to digital. 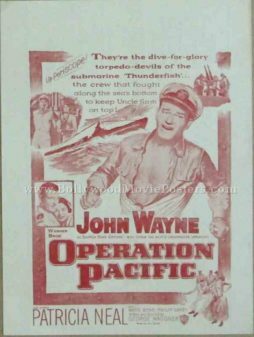 As such, no hand painted or hand drawn movie posters of this film were ever made during the publicity campaign surrounding its first release. 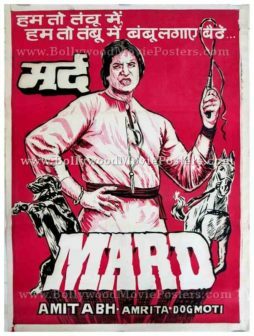 This extremely rare SRK poster which features a large hand painted portrait of superstar Shahrukh Khan, is one among few surviving hand drawn Shahrukh Khan posters known to exist in the world, making it highly collectible! 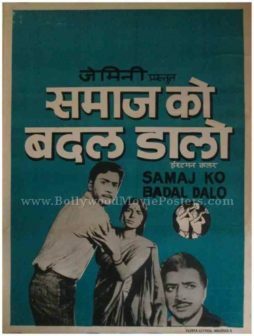 Kabhi Haan Kabhi Naa is considered one of superstar Shahrukh Khan's all time best performances, and has been quoted often in the press as his personal favorite film. 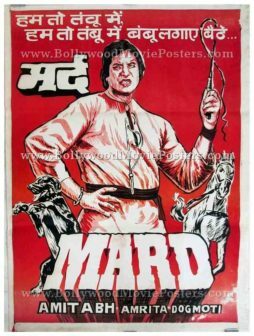 Printed and circulated a few years after the first release of the film (Mid 1990s), this quirky hand drawn old Shahrukh Khan poster was originally designed for publicity of the re-release of the film but never ended up being used. 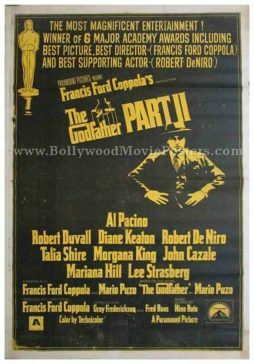 This poster was originally designed on a hand painted canvas by a small time poster art studio in Kolkata, making it very collectable. 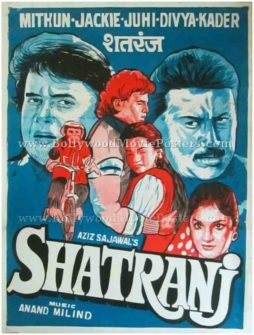 A large hand painted portrait of Shahrukh Khan is seen at the center of the poster, while much smaller portraits of the two supporting actors, Suchitra Krishnamurthy & Deepak Tijori, are seen at the bottom. 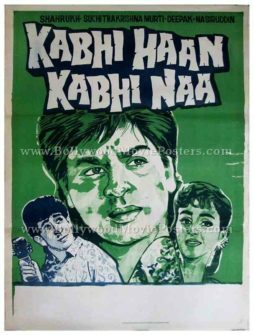 Kabhi Haan Kabhi Naa (Sometimes Yes, Sometimes No) is a 1993 hit Bollywood romcom starring Shahrukh Khan, Suchitra Krishnamurthy, and Deepak Tijori. 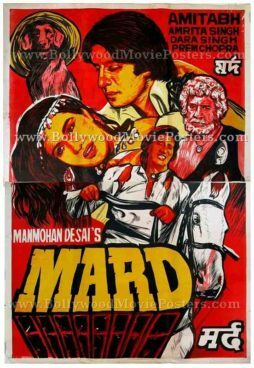 It is often remembered as one of the rare mainstream Hindi movies in which the lead protagonist plays the role of a loser. 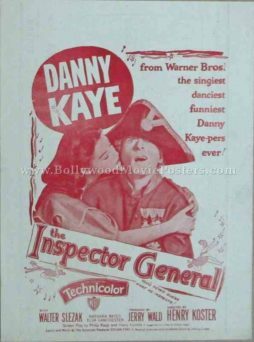 Shahrukh Khan earned the praise of critics as well as an award for his scintillating performance in the film. It is reported that Shahrukh Khan received only Rs. 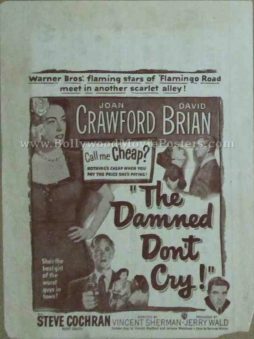 25,000 for acting in the film, which is approximately $400 USD! 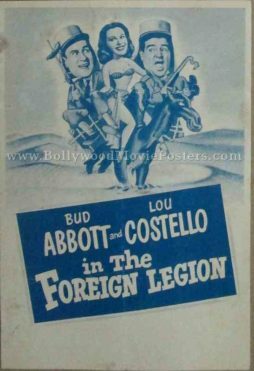 Songs from the film went on to become a rage throughout the nation and are played till today. 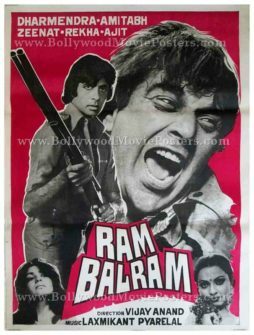 Tracks like “Ae Kaash Ke Hum”, “Aana Mere Pyar Ko Na Tum”, “Deewana Dil Deewana” & “Woh To Hai Albela” topped the charts at the time of its release.